First I'd like to thank vvb32reads for this book which I won on from a giveaway on their blog. This was a book I just knew I had to read, as well as own, as soon as I saw it. It was almost fitting for where I live because we just got an IKEA store in town and the book looks like an IKEA catalog and takes place in an IKEA knock-off store. The book was a pretty original idea in the way it was formatted. However, the story itself wasn't that original. In a way it was similar to the background story of the Poltergeist movie, or any other story where a new building was built on top of an old prison/asylum/burial ground/you get the idea. That doesn't mean it wasn't a good story, don't get me wrong, I just wasn't as blown away as I had expected I would be. Still, I love the format of the book so much that I won't ever get rid of it even if I don't intend to read it again. It will be fun to look at the ads and other pictures in it again. Basically we have the main character, Amy. She is an employee at the Orsk store, but is hoping to get transferred back to the Orsk store she had worked at before, mainly because she's not a fan of her boss. Her boss's name is Basil. And she feels like he is always pushing at her, like he doesn't think she can do her job. On this day it starts with some weird things happening as the store gets ready to open. Some doors aren't opening, the escalators don't turn on right away, a couch is found with what looks and smells like someone took a dirty diaper and smeared it all over. And when Amy tries to sneak around a back way to avoid Basil, she sees a man that she doesn't recognize as an employee in the store before they have opened. When she gets called to the office, she assumes she is going to get fired. But another employee, Ruth Anne is also sitting by his office waiting to talk to Basil. And since Ruth Anne is like "the" model employee, Amy thinks maybe something else is going on. It turns out that the district manager wants them to figure out what is happening to cause these weird things before corporate people stop by. So Basil asks Amy and Ruth Anne to stay at the store overnight to help him catch whoever might be causing these issues. The night starts out pretty uneventful. Other than when Amy keeps going to the bathroom to get away from Basil's annoying talking, she notices graffiti showing up that is new. And then when they go out to do their rounds, they find that one of the doors won't lock. When they split up to continue the rounds, Amy and Ruth Anne run into two other employees, Trinity and Matt, who have snuck in to do their own investigating, only they are there to look for ghosts. Part of the reasoning behind their search for the paranormal is all the people who have received text messages from unknown numbers saying "help" whenever they've had their phones in the store. Also, Trinity has done research showing that the store was built on land that was once a prison with a bad history. Of course all kinds of scary things begin to occur, they get separated, and things go from bad to worse. When Amy tries to call 911 to get the police there, against Basil's initial wishes, the cops can't seem to find the store, their GPS tells them there is no such location. In the end, not all of them will make it out, and those who do will not know how to go on as if the night never happened. When I say scary things, I mean extremely creepy things. I could totally see this as a horror movie, the descriptions of what happen were definitely pretty detailed and like I said, scary. The catalog pictures go from being pretty realistic seeming types of furniture to horror/torture contraptions that go along with the story. A fun, scary read, as well as a quick one. I got this at the Book Expo last year and I thought it looked interesting. I haven't read it yet, but I actually forgot I had it! Thanks for the reminder. It sounds creepy and very different. I need to dig it out of my BEA piles. Great review! Really? I didn't see this at BEA or I'd have grabbed it I'm sure! I won it in a contest though, so guess I still got it for free. It is a very quick read with some good scary scenes in it. Thanks for stopping by! At first, thanks to the cover, I thought it was going to be some sort of Horror parody. LOL! I'm glad to learn that it's a genuinely scary story. =) Thanks for the review! It's more a parody of IKEA and other retail type jobs. But really the scary scenes have some intense moments with very vividly descriptive monsters and such. Hope you get a chance to read it, it's worth it! 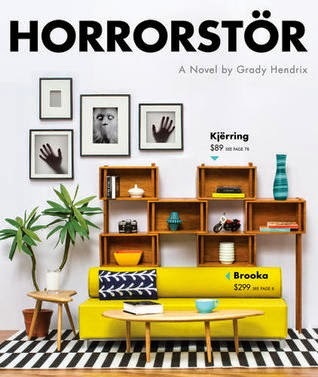 I enjoyed Horrorstor, too, and I also think my enjoyment probably had more to do with the illustrations and the general concept, rather than the actual story. I hadn't thought of this as a movie, but I actually think that would work, maybe as a dark satire, like the Scream movies. Yeah, I think a lot of my enjoyment was for the same reason. It was a very quick read, and definitely a satire type of movie. In a way, like that one with Ben Stiller where there were aliens and they were hiding in the Costco. Thanks for stopping by! I actually really don't like the cover to this book, and covers always put me off or make me eager to read it. I do think it is a creative idea to have this themed like a catalogue, but I don't think it will be my type of read. Especially as I don't dive into horror often. If you don't like horror, this won't be the book for you! It definitely had the horror type moments in it.